A wide swath of central Brooklyn is hosting its second contentious Democratic primary race this year. After a surprisingly close congressional primary in June, voters in a largely overlapping state Senate district will vote in September in another race where an incumbent is facing an upstart challenger. An array of neighborhoods in the borough, including Brownsville, Crown Heights, Park Slope, Flatbush, and Prospect Heights, make up New York’s Ninth Congressional District (map left), where Democratic voters narrowly voted to nominate Yvette Clarke for re-election over her challenger, Adem Bunkeddeko, in a race that drew national attention for its closeness, especially alongside the defeat of Rep. Joe Crowley by Alexandria Ocasio-Cortez. The Brooklyn neighborhoods of Clarke’s district, with the exception of a few, like Sheepshead Bay and Marine Park, also make up State Senate District 20 (map below), which adds Gowanus, South Slope, and Sunset Park, and is represented by incumbent Senator Jesse Hamilton, who is facing a primary challenge from Zellnor Myrie. The two primaries bear some similar contours: a youthful progressive candidate goes for the left flank of a Democratic incumbent amid an anti-establishment milieu, hoping to motivate voters upset by Donald Trump and looking for something different from their elected officials. Bunkedekko’s success as a previously little-known activist and lawyer in the district—he lost by just 1,075 votes—may help provide a roadmap for Myrie, especially in terms of where in the district to go for those anti-establishment votes. But there are key differences between the Clarke-Bunkedekko and Hamilton-Myrie races, including Hamilton’s prior membership in the breakaway Independent Democratic Conference and the flood of endorsements behind Myrie, but a key question for the challenger, incumbent, and all those watching, is: How much can we apply from the results of the race in Congressional District Nine to the race in State Senate District 20? Though ultimately unsuccessful in his bid to unseat Representative Clarke, daughter of legendary former City Council Member Una Clarke, Bunkeddeko certainly came close, losing by four points to a politician who won her previous primary challenge, in 2012, by 77%. 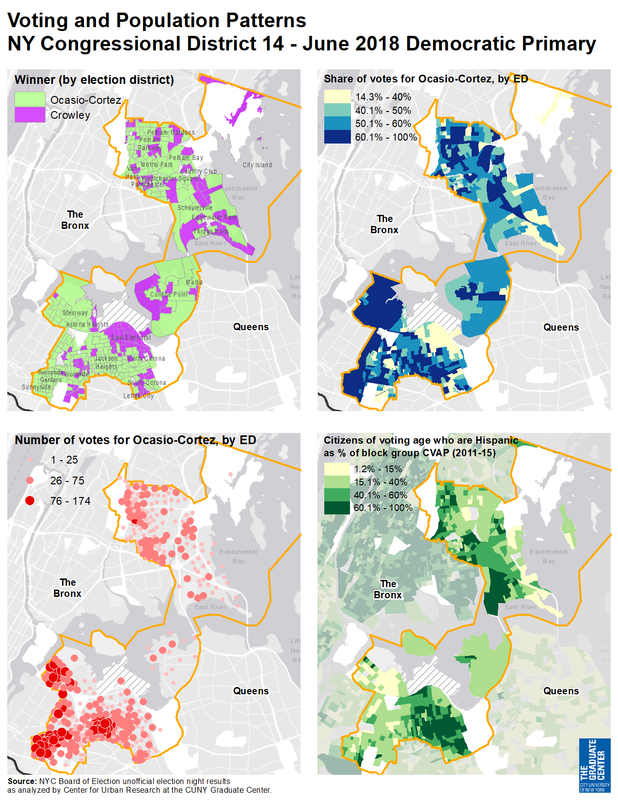 Results of the June 26 vote show Bunkeddeko’s strongholds were in wealthier, whiter, gentrified areas of the district like Park Slope and Prospect Heights, while Clarke excelled in poorer, predominantly black neighborhoods in the eastern part of NY-9 like East Flatbush and Brownsville (map left, via CUNY Mapping Service). It remains to be seen whether this dynamic will be replicated in the race between Hamilton and Myrie. Hamilton is a former member of the Independent Democratic Conference, a coalition of eight Democrats in the New York State Senate that formed a years-long coalition agreement with Republicans to bolster GOP control of the chamber. The IDC formally disbanded this April amid criticism and the declaration of primary challenges by Myrie and a cohort of other candidates. Myrie spokesman André M. Richardson told Gotham Gazette that the campaign was surprised by Central Brooklynites’ widespread knowledge of the IDC. Hamilton’s participation in the IDC is a useful cudgel for the Myrie campaign, providing a unifying talking point about propping up Republican control of the state Senate and blocking progressive legislation in a racially and economically diverse district. In predominantly-black neighborhoods like Brownsville, Richardson said, the IDC ties Hamilton to the prevention of Andrea Stewart-Cousins from becoming the State Senate’s first black female majority leader; in heavily-Hispanic Sunset Park, the Myrie campaign tells voters that the IDC is why the Dream Act was blocked. Through this, and with an intense focus on the ever-relevant housing crisis, the challenger hopes to avoid the polarization of the district seen in the results from June and appeal to voters in every neighborhood. 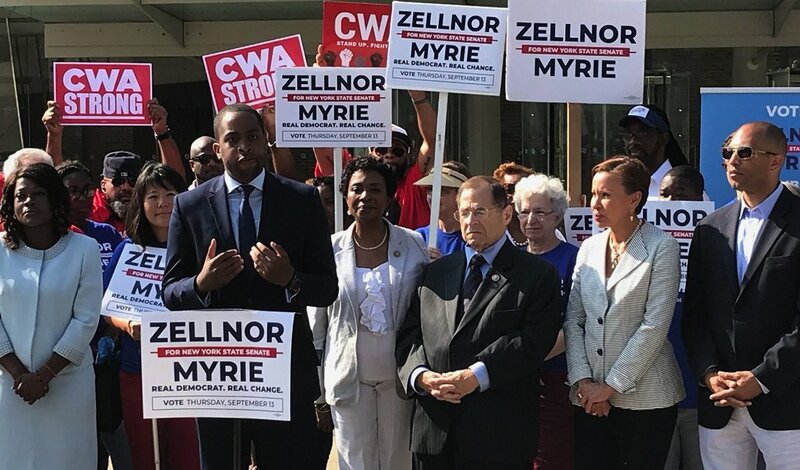 That effort is likely to be helped by the fact that Myrie has been endorsed by a wide swathe of elected officials and clubs, including Rep. Clarke and other elected officials from the area, such as Assemblymember Diana Richardson. The IDC is one of several factors that complicate attempts to use the results of the Clarke-Bunkeddeko race to predict the Hamilton-Myrie contest, despite the two races taking place in, more or less, the same territory. 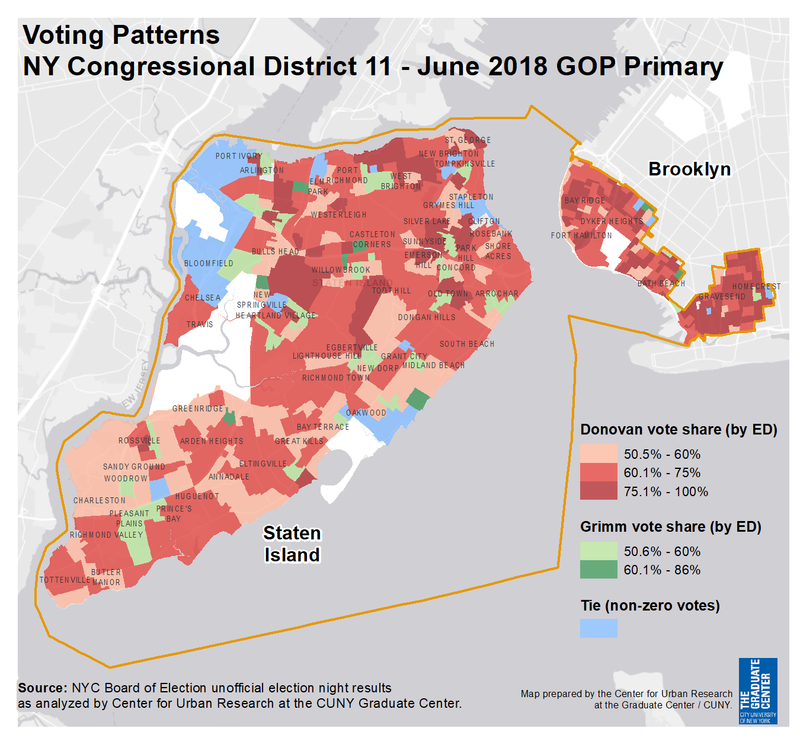 Also, noted Steven Romalewski, director of the CUNY Mapping Service, to Gotham Gazette, “different groups of voters turn out for different races.” Only about 8.2% of eligible Democratic voters voted in the primary between Clarke and Bunkeddeko, making it difficult to generalize characteristics of the voter pool. Voter turnout is expected to increase in September, when the Democratic nominees for the statewide positions of governor, lieutenant governor, and attorney general will also be decided. Two of those races feature black candidates from Central Brooklyn: Jumaane Williams, running for lieutenant governor, and Letitia James, for attorney general. Governor Andrew Cuomo and his primary opponent, Cynthia Nixon, have also focused campaign efforts in the area, aware that black voters are essential to winning Democratic primaries. In last year’s September primaries for city elections, Senate District 20 was home to 21,000 voters, while only around 10,000 residents of the Senate district cast votes in June’s contest when the congressional primary was the only race on the ballot. Though it’s nearly impossible to accurately predict whether increased turnout will help or harm Hamilton, who was first elected to the Senate in 2014, political consultant Jerry Skurnik told Gotham Gazette that “the gentrifiers” constitute a larger proportion of Senate District 20 than they do Congressional District Nine. By Skurnik’s admittedly “not 100% accurate” demographic calculations, 82% of the Senate district lies within the Congressional district, and the overlapping area is about 72% black. But the overall Senate district is just slightly over 60% black, since it includes smaller portions of near-exclusively African-American neighborhoods like Brownsville and East Flatbush and extends farther out of Central Brooklyn, into neighborhoods like Gowanus and Sunset Park that have relatively few black residents. This could spell an advantage for Myrie, if Bunkeddeko’s strength in Park Slope is any indication, and if he is able to move the same voters to the polls while motivating others. But, there are many complicating factors, and neither Romalewski nor Skurnik felt comfortable prognosticating with any certainty. In line with Romalewski’s cautioning that different races motivate different voters, Skurnik emphasized to Gotham Gazette that a race for the New York State Senate necessarily involves issues different from those in a contest for the U.S. House of Representatives. For instance, rent regulations are a marquee issue for state legislators, who will renegotiate current rent laws next year, while the issue is less central to Congressional races like Clarke and Bunkeddeko’s, though candidates for all offices must discuss housing affordability in New York City. Myrie may have an easier time mobilizing residents around his housing-focused campaign than Bunkeddeko, who devoted extensive time to attacking Clarke’s Congressional record (or lack thereof, as he framed it). But, Myrie is also focused on Hamilton’s record in the Senate, especially around progressive bills that have not passed because Republicans, supported by the IDC, did not favor them. The polarized, racially and economically divided results of the NY-9 primary will not necessarily reproduce as such in Senate District 20, Skurnik said, because both Hamilton and Myrie have seen them. “Senator Hamilton knows what happened,” Skurnik said. “He knows where the Congresswoman did badly...He’s not going to be surprised.” The same holds true for Myrie, he added. If the results of the June primary can teach the candidates of District 20 anything, it seems, it’s what to avoid. Alexandria Ocasio-Cortez’s upset primary defeat of Representative Joe Crowley has sent shockwaves through both the New York and national political worlds. The 28-year-old Latina democratic-socialist who has never held elected office and refused money from corporate PACs stood in stark contrast to Crowley, a 56-year-old, ten-term Congressional representative who was a prolific Democratic Party fundraiser, served as the chair of the Queens Democratic Party, and was seen by some as the next Democratic Speaker of the House. Ocasio-Cortez’s win is being partly attributed to her campaign’s organizing, strong ground game, and significant social media presence, as well as its embrace of progressive policies such as ICE abolition and single-payer healthcare. She didn’t merely upset Crowley, she won handily, by a margin of 57.5 percent to 42.5 percent. Maps compiled by the CUNY Center for Urban Research show that support in the election that has the country buzzing did not break down neatly on racial lines; in fact, Ocasio-Cortez maintained strong support throughout the district, across areas of various demographic makeups. “This wasn’t a fluke,” said Steven Romalewski, of the Center for Urban Research. 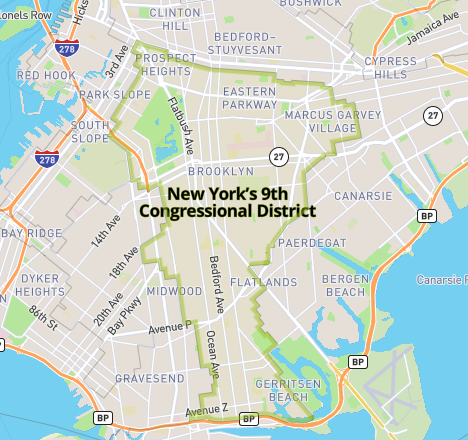 “She was able to get voters from almost every neighborhood to come out and support her.” Romalewski noted that, contrary to the conventional wisdom of voting on racial lines, the areas where Ocasio-Cortez’s showing was strongest were areas that weren’t predominantly Hispanic, signaling that her showing may not have been due to the district’s changing demographics (it has been steadily becoming less white for years), but due to desire for change from Crowley. Though Ocasio-Cortez whipped up energy among voters in the Queens and Bronx district, and there is little to compare voter turnout to because Crowley had not been challenged since 2004, the primary election was decided, like most elections in New York, by a relatively small number of people. With 98 percent of precincts reporting as of Wednesday, the State Board of Elections shows 27,826 registered Democrats cast votes in Tuesday’s primary in New York’s 14th District. With 235,745 registered Democrats as of April, according to the BOE, this comes out to a turnout of around 11.8 percent. This turnout is about the same as in Crowley’s last competitive primary, in 2004. According to the Federal Election Commission, 12.4 percent of Democrats in Crowley’s district voted that year, which was a presidential election year, unlike this year, and saw congressional and state-level primaries on the same September day. New York has since moved its congressional primaries to June. For comparison, when Crowley was reelected to Congress two years ago, in 2016, he faced no primary opponent and nominal competition in the general election, but in the general he received 147,567 votes as many more voters turned out on Election Day than typically do for party primaries, even when they are competitive. Ocasio-Cortez will herself now face Republican Anthony Pappas and Conservative Elizabeth Perri in the general election, but is expected to win easily. Regardless of the low primary turnout, Romalewski characterized Ocasio-Cortez’s win in the same way as most other observers: a massive upset. Turnout on Tuesday was similarly low in other closely-watched congressional primaries. In the 9th District, in Brooklyn, where Representative Yvette Clarke narrowly beat New York Times-endorsed Adem Bunkeddeko 52 to 48 percent, Democratic turnout is only at about 8.2 percent with 99 percent of precincts reporting, according to the BOE. 28,663 Democrats voted out of 347,466 total in the district. In the 12th District, including parts of Manhattan and Brooklyn, where Representative Carolyn Maloney dispatched challenger Suraj Patel 58 to 41 percent, Democratic turnout stands at about 13.6 percent with 99 percent reporting. 41,460 Democrats voted out of 304,115 total in the district. 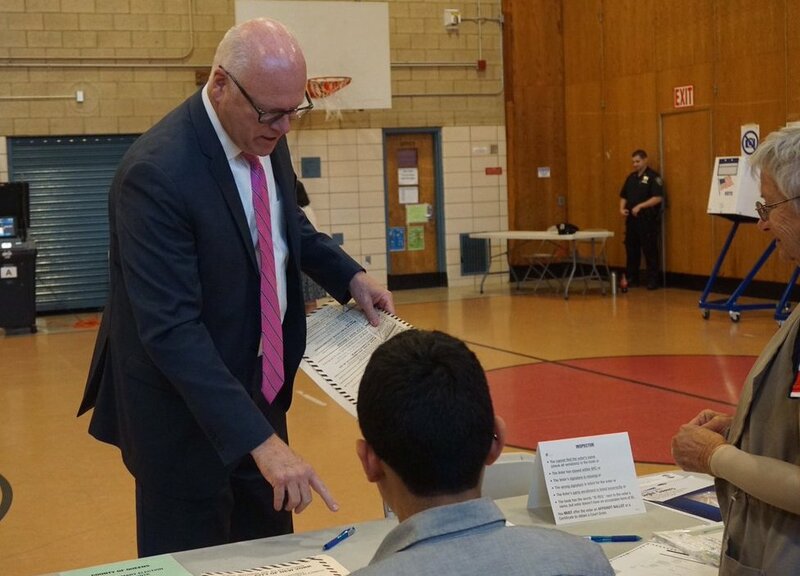 Turnout was slightly higher in the Republican primary in the 11th District, covering Staten Island and part of southern Brooklyn, where incumbent Representative Dan Donovan was seemingly running a tight race with his predecessor Michael Grimm, only for Donovan to handily beat Grimm, 63 to 36 percent. That primary, featuring a rare such primary battle of the two most recent officeholders and an apparently race-altering endorsement of Donovan by President Donald Trump, saw a turnout of 17 percent of registered Republicans -- 20,118 Republicans voted out of 117,983 registered in the district. Similarly to Ocasio-Cortez’s convincing win District 14, Romalewski noted that Donovan’s strong support was widespread across the district rather than being concentrated in pockets. He won the overwhelming majority of election districts, and beat Grimm by significant margins in both the Staten Island and Brooklyn sections of the district. In the crowded Democratic primary in District 11, Max Rose defeated five other Democratic hopefuls with 63 percent of the vote. That primary saw a turnout of 8.5 percent -- 17,098 Democrats voted out of 200,410 total registered in the district. The Donovan-Rose general election is expected to draw a lot of interest, and money, from around the state and country, as Democrats see it as a possible pick-up toward flipping the House. In Maloney’s last noteworthy primary challenge, from Reshma Saujani in 2010, turnout stood at 16.4 percent. The last competitive primary in the district represented by Donovan was in 2010, when it was the 13th District and Grimm defeated Michael Allegretti in an election with 13.7 percent turnout. Both of these primaries occurred before a 2012 federal court decision that led New York to become the only state this year with separate federal and state primary days, wherein the state was forced to move its congressional primary earlier in the year and lawmakers declined to also move the state-level vote. The separate days can depress turnout, says Romalewski. Clarke’s last primary challenge, in 2012, saw a 6.2 percent turnout. Maloney faced a challenge in 2016 from attorney Peter Lindner, in a race that saw a 6.7 percent turnout. Turnout was similarly low elsewhere in the city and state. In the 5th District, where Representative Gregory Meeks won 81 percent of the vote against two challengers, Mizan Choudhury and Carl Achille, saw a 3.8 percent turnout. In the 16th District, Eliot Engel dispatched three challengers -- Jonathan Lewis, Derickson Lawrence, and Joyce Briscoe -- with 74 percent of the vote in an election with 9.8 percent turnout.